Not a huge fan of basketball, and this thread doesn't have anything to do with basketball but I wanted to showcase some of my gear and please feel free to show case any gear that you've recently picked up and plan to dive this year! The image below is a test, it's one that I've edited to change the colour, can't remember where I found it. Heck yeah! TD's got pics! For the first post of 'March Madness", I have the Spiro Mistral I received from Phil, as well as a Beuchat Tarzan wetsuit, and an early Aqua-Lung BC. Still holds air and happens to work orally and with a 16g CO2 cartridge. Here is the serial number. 38118. 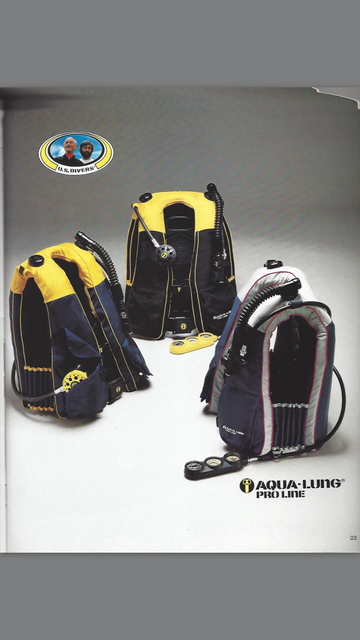 The second post of March Madness is about the Pro Line BCDs from Aqua Lung. I happen to have both models. One is missing some parts in the photo, those are in a bin in my garage. Here are the pictures, and heres the catalog. In one photo is an 6351 alu tank, the "bad alloy". Do those BC's still hold air? If you need some parts for them, I probably have some in my bone pile. I haven't looked lately, but I could have a few of those consoles shown in the catalog picture. Both BCD's still hold air and are functional. I'm gonna use one myself (the silver one) and I might just keep the yellow one for display purposes. I have a couple SPG's that I'll show soon, and one console is pretty neat but I have no idea what year it is. "Hey that's cool, can you put a fade in there?" "Dude, that is so totally rad... OK, now make something in the corner that looks like ice, or, or, or... foam!" That little image of JYC and his son is so jarring--WOW! Jay I think this was 83 if I'm correct! I had no idea that photoshop has existed for that long, I thought it was like a 1999 thing! There's more coming today, March Madness Day 3! It had to be before 1979, as that when Philippe Cousteau was killed. He died aged 38 in 1979, when his PBY Catalina flying boat crashed in the Tagus river near Lisbon. The aircraft nosed over during a high-speed taxi run undertaken to check the hull for leakage. 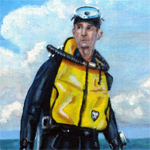 The propeller detached from the engine and killed Cousteau instantly. All others on board survived. His son Philippe Cousteau Jr. was born six months later. In your first photo in this thread, anyone notice any discrepancy in the equipment shown? Last Edit: Mar 13, 2019 14:37:18 GMT -8 by SeaRat: Couldn't help myself--had to post; now back to my manuscript. Sorry for the confusion, that's not phillippe that's Jean-Michel Cousteau. JMC! There was also a line of JM Cousteau Gear. I'll post some on that soon. I don't see any discrepancies John, do you?? A while back someone had one of these on eBait: they had it listed as a Jim Cousteau-regulator, not "J.M." Ol' Jimmy got himself a yellow 1979 Trans AM, he liked it because he could kick he snot out of his dad's Peogot: he loved the car so much he insisted they make a yellow regulator in its honor... Dude, it's all totally true--REALLY! Yes, I see a discrepancy. These Cousteau divers, and Jacques Cousteau himself, are wearing the integrated unit, which normally we saw with a front-mounted integrated regulator. But they are all using a tank-mounted Royal Mistral double hose regulator. Sorry John, I thought you meant in the first picture like that I posted of my gear. I misunderstood you. I can explain that. These were the special Hydrodynamic Aqua Lungs designed for the Antarctic expedition. Only 4 were made. Ryan Spence has one of the original arctic units. The UWOJC Hydrodynamic aqua lung that he has is made from casts of the original, if I'm correct. It was different as it had a backmounted Mistral rather than on the chest. The helmet was also different.